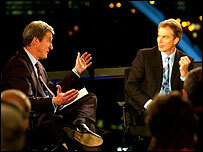 Broadcast Magazine's Award for Best News Programme went to Newsnight - Blair Special which went out February 2003. The judges were inundated by news programmes covering the fall of Baghdad. But while most managed to do an excellent job very few presented exactly what the panel was looking for - a programme adapting to unfolding events in an innovative way and fearlessly tackling the unexpected. With those criteria in mind this category came down to a straightforward tussle between two heavyweight interrogators - Jon Snow's unexpected interview of Alastair Campbell in ITN's Channel 4 news and Jeremy Paxman's handling of Tony Blair for BBC2's Newsnight. In the first case, Campbell turned up unexpectedly to be interiewed on Channel 4's early evening news slot and most of the show was junked to carry out a tough live interview. The judges agreed that this was high drama, unfolding live on national television and has probably marked the point at which Campbell's departure from Downing Street became a question of 'when, not if'. Bu the winning news programme was an interview not with Campbell, but his boss. On the eve of the Iraq war last February, Newsnight gathered a couple of dozen staunch opponents to military action and allowed them to question the Prime Minster. They were backed by Jeremy Paxman who conducted his own forensic examination. It is a testament to the programme's integrity that Blair agreed to appear, knowing that the questioning would be rigorous. "This touched a nerve with the country, and contributed hugely to the national debate," said one judge. "It was fantastically well executed. Paxman was on his best form. The interchange about whether Blair prayed with Bush was unforgettable". Airing as a special edition at 21.00 on 6th February, the interview gained an audience of 4.2 million, almost double the average audience for this slot. For these reasons the judges could not fail to hand the prize to a potent night for Newsnight.